Anxiety can be described as “misplaced concern.” Many are over-wrought and disturbed by the way life is developing for them. They can’t make it work, and find themselves in a place they regard as perilous. They are stressed and then try to imagine themselves to a place of success. But a year from now, they will not have improved and find themselves in pretty much in the same place. The evil of anxiety is that we become overly concerned with the future— today. Under a great deal of worry, we develop a deep tendency for fear. Soon doubt filters in and we work ourselves up into a significant problem. Seeking success we find ourselves in the chains of anxiety and worry. Jesus declared that we should never ever be anxious. He suggests that anxiety will never pay-off. Our fear over our future can bring us nothing but spiritual poverty, and emotional crisis We find a bag and we try to collect some security and certainty, but little do we know that our bag has holes. It holds nothing, and leaks everything. No matter what we think, we change a single thing. Concentrating on wealth and success will in the long run, is futile and empty. We can’t make an iota of a difference. Security for us is not what we can scrape up, but it is found in coming under the control of Jesus Christ. We have an awareness that life is cruel, capricious and demanding. We sift through our life, our eyes eager to find something, anything that will help us. And, we find nothing. But faith in God will push the anxious thoughts out. 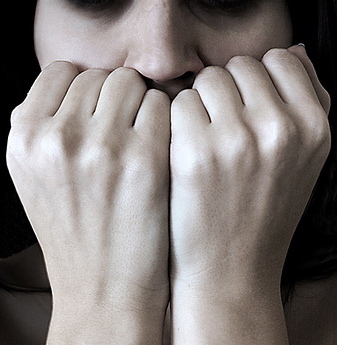 Anxiety seems to be a disturbing companion to those of us with a mental illness. (We definitely don’t like his company.) Anxiety shapes us and victimizes us, and we often find ourselves in a confusing place. But understanding the presence of anxiety is just a half-step towards freedom. We must shake ourselves of the fear and doubt that accompanies this sin. We must trust our Father, and completely lean on his grace. We must learn to pray again. General Anxiety Disorder (GAD) is a seperate category of mental illness, and although similar to the anxiety experienced by many, requires the help of medical professionals. We should not confuse the two. GAD is an illness and not just basic anxiety. Panic attacks can often accompany GAD. Get help if you think this might be an issue for you. Visit http://www.medicinenet.com/panic_disorder/article.htm for more information.